I don’t remember the Cinema-70, but by the time I was old enough to become a moviegoer it had changed to a 3-screen, 35mm multiplex like all the rest in town, where I had to sit on my mom’s lap for Return of the Jedi because it was so full. The theatre closed shortly after, and sat vacant for a decade, until it was torn down and turned into a parking lot for the gym next door. In 1971, however, it was a single-screen “Cinerama 70″ theatre. In the 1960s, whoever built the theatre banked on the belief that Cinerama, the wide-aspect-ratio film style popularized in the late 50s and early 60s, would be there to stay. By the 1970s Cinerama was rarely used, few studios even had equipment to film in it, and it had been bastardized from the original 3-camera setup to an anamorphic widescreen format. The Anderson Tapes was filmed on standard 35mm film with a normal aspect ratio, which left over half of a Cinerama screen unused. It’s no wonder the theatre broke up their one-room schoolhouse into a three-screen theatre. 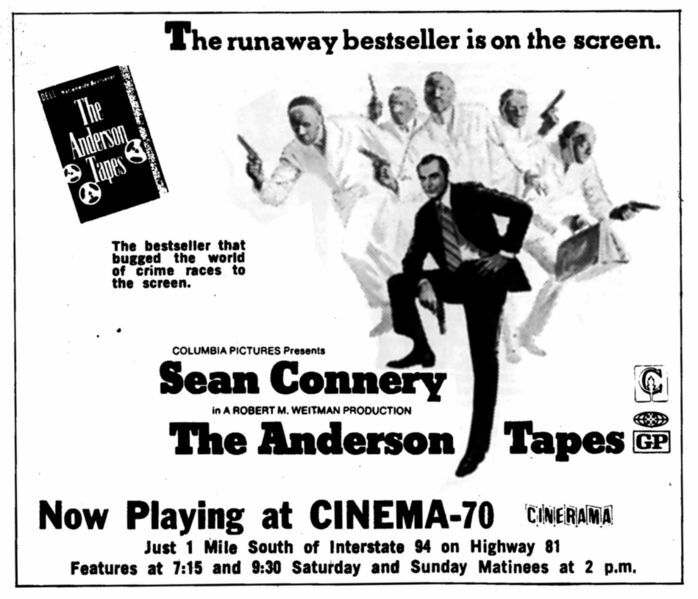 On the right-hand side of the ad, it looks like a typo, but not really: 1971 was in some of the early years of the MPAA’s voluntary film rating system. “GP” was the replacement for the “M” rating, when people found the “M” and “R” ratings too hard to tell apart. “GP” meant, essentially, what “PG” means today, but too many people thought it meant “general public”, thus confusing it with the “G” rating. There was just a narrow 2-year window when “GP” was used. This entry was posted on Wednesday, December 3rd, 2008 at 7:52 am	and is filed under Uncategorized. You can follow any responses to this entry through the RSS 2.0 feed. You can leave a response, or trackback from your own site.